Swain County has joined the countless communities across the nation with a quilt trail — barns and buildings adorned with painted square quilt patterns. It’s a growing trend that’s become especially popular throughout the southern Appalachians. 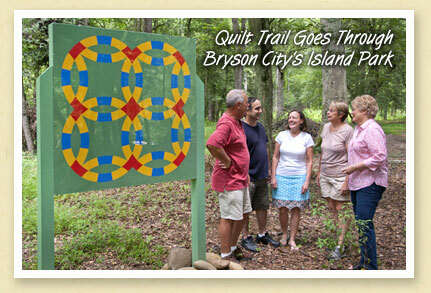 The county’s second quilt block was installed this past week, not on a building but on Bryson City’s Island Park. Above, members of the ‘Swain County Quilt Trail’ committee voice their appreciation to Anthony Viscusi and Tee Angel who donated the block. Ms. Angel chose the ‘double wedding ring’ design for the way that it “celebrates the park’s flora year around.” The next quilt block will be installed on the Bryson City’s train depot courtesy of the Great Smoky Mountains Railroad. For more information, contact the Swain County / Bryson City Chamber of Commerce. Pictured, left to right: Mike Glover, Anthony Viscusi, Tee Angel, Rota Krape and Ellen Snodgrass.